It’s hard to tell, except for the last b&w pic, but loving this black/black leopard pattern pants from Zara. I was wearing with hot pink sweater I bought at a random store, and my vintage celine goes with everything..! I absolutely love those pants. The leopard print is such a great detail, but they are still black pants that go with everything! Great pants, Akiko. And I love just how bright that sweater is. I absolutely love the black leopard pants! So cool! Love those jeans and that candy pink sweater! Gorgeous! Love the Celine bag an the fun leopard detail on the pants! LOVE those black leopard jeans, and that pop of pink sweater is PERFECT! Great look darlin! That vintage Celine bag is beautiful:))! loving your pink sweater so so much!!!! Great look, loving the neon pink. love your pants and how it looks with pink. 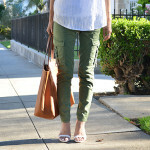 I’ve had my eyes on those ZARA pants for a while now! Love that you paired them with a bright color. Color blocking is here to stay!